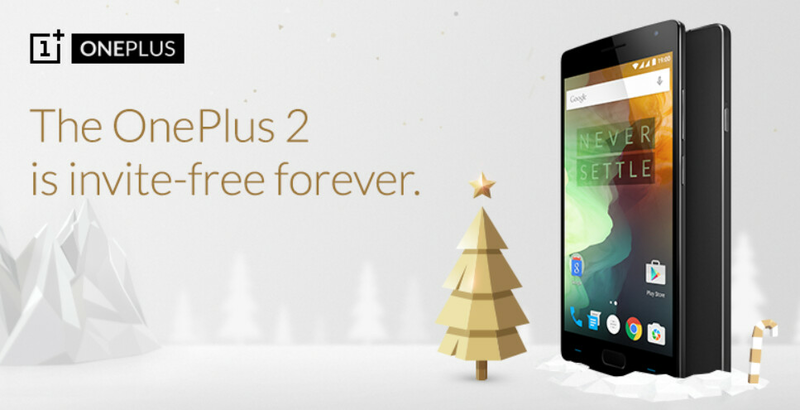 The controversial invitation system employed by OnePlus for the OnePlus 2 will be ending forever on midnight December 5th. The company instituted the system immediately when it launched the OnePlus One as a way to match supplies with demand. As a new start-up back then, building too many handsets that could go unsold might have led OnePlus to financial ruin. Instead, the company had to endure criticism from some. Still, there seemed to be enough invites to go around. Forum contributors, OnePlus customers and contest winners were always being sent invitations. The company made the announcement on its website, two-weeks before it celebrates its second anniversary. This year, the company has released two new models, the highly-spec'd One Plus 2, and the OnePlus X. The latter, which currently requires an invitation to buy, will be invite free from December 5th through the 7th. The OnePlus 2 is available in a 4GB RAM/64GB ROM configuration for $389. A version with 3GB RAM/16GB ROM is priced at $329. OnePlus also announced that from December 5th through the 7th, all OnePlus 2 StyleSwap Covers are 50% off, and select OnePlus One accessories will be reduced by 90%. Other accessories will also be priced at 10% off. If you're ordering from the company for the first time, you just might end up with a Never Settle mouse pad. With the holidays in mind, OnePlus promises that any device or accessory ordered by December 7th will be in your hands for the holidays. Buying thier phone should never had required an invitation! Much less from an unfamous brand, for that matter! Being a non-famous brand is exactly why they needed the invite system. Complain about how it was run all you like, but it being there is a large portion of how they survived to make a second phone. Exactly. Also which other phones have SD810 + 4GB RAM + 64GB storage out of the box + Finger Print Scanner + Great Dev support all under $380 ? LOL, how long have you worked for Oppo/OnePlus?? That's if the FSs doesn't randomly stop working after two-three weeks like most OP2 users are reporting. Their invitation only gimmick obviously did not work. They probably did an invitation system to control inventory quantity. Not for gimmicks or because they are unbranded. I don't dog on them for that......their problem is the competition. There are much better phones that don't run some rinky CyanogenMod. Which phones exactly you're talking about in the same price range? Some other options are: LG G4 $400 Nexus 5x $379 I can't think of anymore at the moment, but when the OnePlus One came out, there was nothing competing with it. Nope. Snapdragon 810 > 808. Adreno 430 > 418 in Moto X style. Also its more expensive. LG G4 - No finger Print scanner. Nexus 5X - Also a No GO for various reasons. Not really the case in Netherlands. G4 is 439(plastic) and the 5X is 479. so op2 seems like a good choice. I am pretty sure you are right. The invitation system was created to control inventory quantity since they are such a small company. Too many phones in production would cause them to lose a good amount of money. The system was a good way to increase the reputation of the product (it became more coveted because of it's exclusivity) and control budget. But like you said, competition is getting better, and there are other great options that don't require people to wait. Buying into the "small company startup"? Nope, they are a marketing gimmick created by Oppo, who OWNS THEM. (Well, BBK electronics actually owns them, but I digress). Oppo, doesn't have the resources to beta test, they create a new "company" called OnePlus, use viral media to hype up their device, use small amounts of fancy ads. Use a super low price and teases of this gimmick or that, to bring up the feeding frenzie. Make a PRE-order system so they get the money up front, build the device, ship it, and see what happens. As feedback from ticked off users floats in (OnePlus One, yellow screen, buttons not working, software problems), they try to fix them. Then when the bugs are fixed (hopefully), the production line has the building of the device down pat, and they release the Oppo phone, for a higher price, with the OnePlus One features that were missing, added. OnePlus One = Oppo Find7. OnePlus 2, came with the silly overheating SD810 chip. Marketed by Oppo & Snapdragon as "version 2.1" in hopes of calming fears of overheating. Oppo uses a complete metal chassis, and some creative uses of thermal paste, and software underclocking in hopes of keeping the heat down. It's released, and still the complaints of overheating and poor battery performance come in. So, what does Oppo do? They POSTPONE the release of the Oppo Find9, until AFTER the SD820 chip is released. When the OnePlus 2 was released, even their "CEO" was caught on tape saying (what is now the OnePlus X) was going to be his daily driver, on the launch day of the OP2! So, to call them a "startup" as they do, is at best, misleading, and mostly a lie. Ah, I see what you mean now. That makes sense, I stand corrected. Thanks for the information! They could have accepted orders then make them in batches. People would have been fine with throwing them money if they were just given a rough estimate on when they would receive the phone instead. Can you please mention which phones are you talking about? I am using a OP2 right now and will be buying another one pretty soon. So which other phones have SD810 + 4GB RAM + 64GB storage out of the box + Finger Print Scanner + Great Dev support all under $380 ? Please add to the list: laser focus, OIS, Dual-sim support and last but not least: almost pure vanilla Android. Finally came to their senses huh? Too little too late. The Oneplus X is a freaking slick phone for its price. Probably the best looking phone I have seen yet and that display is fantastic. I wonder where they got those OLED panels from but they are amazing. LG? Whoever it was, Samsung has competition now. This is interesting. I've been thinking about picking up a new handset after the holidays. I may put this on my shortlist along with the G4, Moto X Style (getting one in Canada isn't that easy) or a Nexus (undecided on which one). I worry that the 6P will be too big. I had a Note 4, and that push the size limit for me. The G4 is probably leading the pack right now, but I do think it would be cool to have a device with a fingerprint scanner. Isnt LG G4 or S6 or any other current flagship better buy than this? Too late, ordered an LG GFlex 2 via Ebay. $190 brand new, unlocked. I care more about getting my hands on one plus x. It's a mid range so I expect it to be more available in my country next year.